Essie the American gem of a nail polish brand used to only line the shelves of Auckland's major department stores. A few months ago it disappeared but thankfully it has returned better than ever before. Whilst walking back from classes last week I spotted the display in a chemist and I had to go have a rather excited browse (of course!).. The latest additions to the polish collection-Mint Candy Apple and Watermelon. One major change you'll notice is the shade selection. 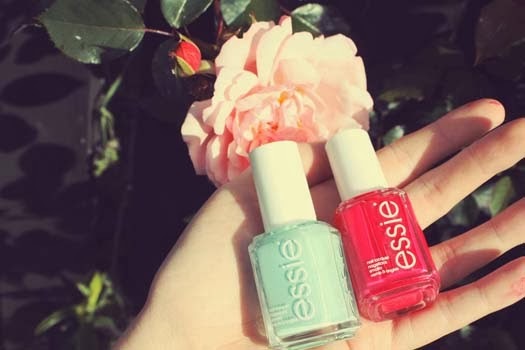 It has dramatically improved and you'll find all of Essie's popular colours from Mademoiselle to Watermelon are here. Another major change is the brush size. If you're familiar with the new Rimmel Salon Pro polishes you'll know they feature a wider brush. Well, so do Essie's. I think it may be slightly wider than the Rimmel offering. What this means is that it's a lot easier to paint your nail in one stroke. The polish also dries super fast-if you're impatient like me then this is a good thing. Now how do the colours add up? Well, some of you may have noticed I seem to have accumulated a few polishes of the mint green variety. None of them are identical though. Mint Candy Apple is probably the closest shade I own that resembles the signature Tiffany & Co blue. Unlike other pastels this doesn't apply streakily but you will need at least two coats if you want an opaque finish. Watermelon on the other hand is a berry red. The colour reminds me of Strawberry jam actually. This shade has more of a glossy finish to it which gives you the whole salon-manicure effect. It is safe to say that Essie's return was definitely worth waiting for. If you're in New Zealand you can pick Essie colours up now from select pharmacies and Farmers stores. Summer seems to have finally arrived in the Southern Hemisphere and with that brings a change in makeup. 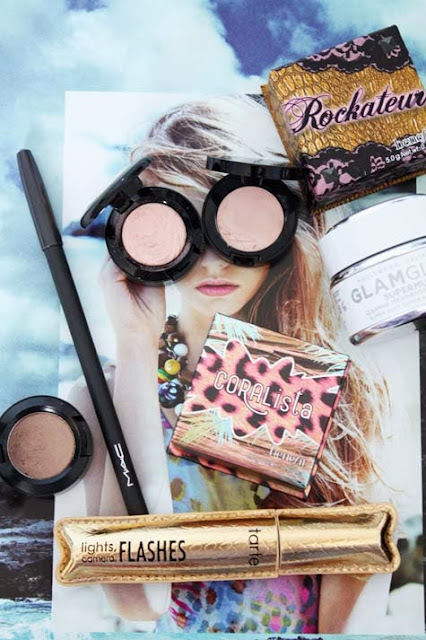 Lighter bases, neutral eyes, bronzed skin-you know the drill. Without further ado, it's October Favourites time.. Benefit Boxed Blushes Admittedly I don't wear an awful lot of blush but this month I've been alternating between Coralista and Rockateur quite a bit. Both these shades are very wearable. They are quite glittery in the pan but don't let that intimidate you. Once applied these leave you with a sun kissed, radiant glow. Tarte 'Lights, Camera, Flashes' Mascara This is the first Tarte product I've tried and it's safe to say I am impressed. One thing I love about this mascara is that it is formulated without parabens or phthalates and instead contains vitamin derivatives which help thicken the appearance of lashes. This mascara has an almost cat-eye effect once on the lashes which is stunning. If you're after a long-lasting, smudge proof mascara then you will love this. PS-Tarte if you're reading, please start shipping to New Zealand. Mac Eyeshadows in Woodwinked and A Natural Flirt (limited edition) I've shelved my bronze eyeshadows for now and replaced them with light golds and sheer champagne shades. Both these colours are gorgeous. If you're after neutral eyeshadows you really cannot beat Mac's. Bobbi Brown Corrector in Porcelain Bisque The creamy, dark circle banisher. No matter how tired you look this will always make it a little less obvious. This one also works well on discolouration and scars that just don't seem to fade too. Mac Eye Pencil in Coffee If you're wary of black liner then you will like this. This is subtler than jet black liner and is the perfect shade for adding definition to the lashline. The Week in Instagrams @nanawintour: *Summer inspiration. *Relentlessly Red. a new lipstick purchase from the Mac Retro Matte collection. *The Sun came out and so did the flowers. *Sleep, how I love thee right now. *The Complexion Savers. *Divine cupcakes-so good! Must-Watch of the Week: I'll be honest, I can't really remember what I've watched from my subscription box this week. Given that it's nearly Halloween though this cupcake tutorial might interest some of you. Zoe and Alfie made spooky cupcakes, complete with all sorts of gruesome toppings. I might make some of these post-exams next week. Product of the Week: This week I rediscovered something I haven't really used in ages. The product in question was my Mac Mineralize Skinfinish in Soft and Gentle. This is such a gorgeous highlighter. It is shimmery but this powder is quite finely milled so you aren't left looking like a disco ball. I like to use this over the top of neutral eyeshadows as well to give them a bit of extra sparkle. It's the perfect all-rounder. Must-Read of the Week: I've been reading a lot of fashion blogs lately. One of my favourites is Views of Now. Isabella has awesome style and her outfits are always well planned, very high fashion. Definitely go check it out. Added to the Wishlist: Sephora's website is like a visual, virtual beauty heaven. The obvious downside of course is that the physical stores are thousands of kilometres away-that doesn't stop me having a gander every so often. Anyway, this week the Tarte 'Amazonian Clay' blushes have been taking my fancy along with the 'Lights Camera Lashes' mascara. I've been really impressed with the reworked version of this mascara and their blushers get a whole lot of love online. There's stunning shades and they're incredibly long lasting. Dark circles, discolouration, blemishes and scars that just won't go away. Sound familiar? Usually I am trying to conceal one of the following most days, more often than not it is dark circles. 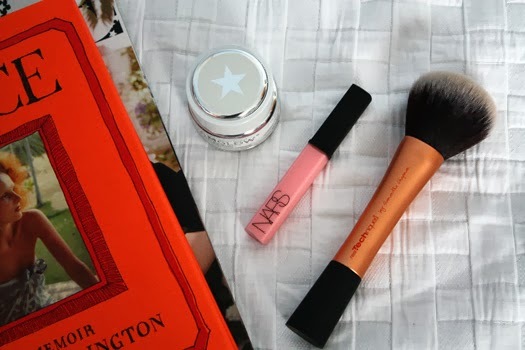 There's a trio of products that tick all the brightening, concealing and correcting boxes for me. Bring in the complexion savers..
Bobbi Brown Corrector in Porcelain Bisque Regardless of whether or not I have dark circles, this corrector gets used every day. It's partly self consciousness but also just a habit for me now. The pink undertones help to counteract the appearance of fine blue lines under the eyes. This is also something I like to use on discolouration and any scarring that may be fading. The corrector is very thick so you only need to use the smallest amount. I lightly press this in with my ring finger which helps warm up the product and lets it sink in more easily. This lasts all day without creasing and works wonders on dark circles. I'll definitely be repurchasing this. Origins Plantscription Concealer #2 This concealer is creamy but it is lightweight so it works well under the eyes. After applying corrector I place this under the eyes and blend it in with this brush. As this shade is a little bit warmer than the corrector it blends in well once the rest of my makeup is applied. Once set with powder this and the corrector don't budge. Nars Radiant Creamy Concealer in Vanilla You've heard the hype and the raves about this concealer-they're all true! The shade range of this concealer is spot on. It's hardly surprising that Nars keep selling out of this one. This concealer is incredibly creamy (as the name suggests) which makes it super easy to blend. It also is really long lasting once applied and is great for covering blemishes, scarring, anything really. This is another concealer I'd repurchase. *What are your favourite concealers? The Week in Instagrams @nanawintour: *Another cat photo, *Online Beauty Shopping 101, I saw One Direction's show on Sunday. It was so freakin' good! *What's in my bag most days. *I picked up some of Lush's new Christmas products. Definitely check out the bath ballistics. *Another Wicked costume, this time in the windows of Smith and Caughey's. This dress is stunning in person. Must-Watch of the Week: In case it wasn't obvious by now I love Lush. 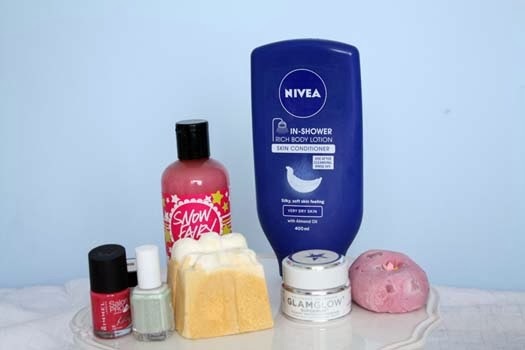 Their bath and shower products are some of my favourites along with Sea Spray. Anyway, Estee uploaded this haul of some of their latest and greatest new releases. If you've ever wondered what's worth picking up from their Christmas collection then you will like this. Advanced apologies for any wallet-emptying. 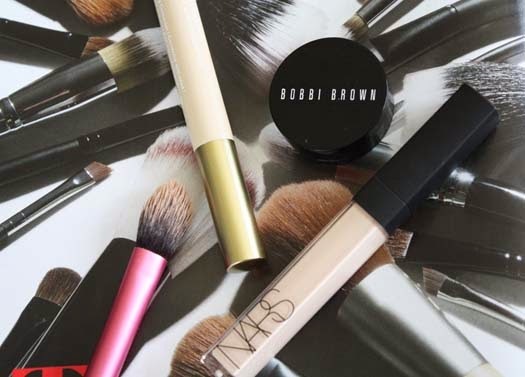 Product of the Week: Bobbi Brown Corrector. I have the shade Porcelain Bisque which has pink undertones. This corrector is designed to cancel out dark shadows under the eyes. It's creamy but not too thick and conceals a multitude of sins. I use this on discolouration and scarring as well-it basically lives in my makeup bag 24/7. Must-Read of the Week: So it seems like every fashion and beauty blogger has their well-thumbed copy of Man Repeller, if Instagram is anything to go by. This week I've been revisiting The Man Repeller online, which admittedly I have only briefly looked at before. Now I am hooked though and if you're a fan of fashion, beauty and good writing then you will love this. Added to the Wishlist: When it comes to beauty I have a strict 'one in, one out' policy. Basically anything that's a bit old or maybe not used gets discarded, passed on to friends or sold online. Part of this means I'm trying to downsize my eyeshadow collection so that I only have a couple of palettes. Long story short, I want to move my Mac shadows into one of their bigger palettes. It'd save on storage space and they'd all be in one easy-to-access space. Too tempting. I was first introduced to the world of online shopping when my parents used to order me American Girl books from Amazon. Last year I discovered the heaven that is online beauty shopping. This trio of digital delights certainly deliver the goods. Grab yourselves a pen, paper and get comfy. Beauty Bay was discovered after hearing Shannon sing its praises over on her channel. Beauty Bay is probably best known for selling Urban Decay's products like the Naked 2 palette pictured. As well as Urban Decay they are also home to This Works, RMS Beauty-Miranda Kerr's favourite and many more. Beauty Bay has free shipping but you can pay a little extra to get your things shipped faster to you. Most of my orders arrive safely within two weeks. To be honest the wait is worth it for the money you save. Feel Unique was another YouTube-centred discovery, this time from Fleur's channel. It is home to some of my favourite beauty brands like Caudalie, Korres and Real Techniques to name a few. 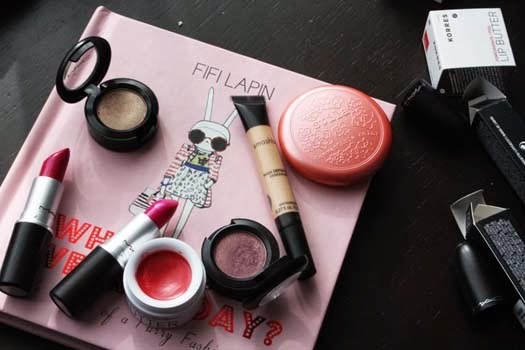 Compared to Beauty Bay, Feel Unique has a wider range of brands to buy from. While some may not ship to countries outside Europe, there is enough available to keep most beauty lovers satisfied. All my orders from Feel Unique usually arrive within ten days, sometimes less. They also have free shipping and everything is always packaged very well so there's no risk of anything breaking. Sometimes it is easy to forget to take time out of our busy lives to relax. The reality is that sometimes there just is no time. Over the weekend though I took some time out to just relax and do things that are enjoyable to me. One way I love to unwind is to have a bath and read books or magazines. Standard really but there is something about baths that is just so..luxurious. The bubbles, gorgeously scented and coloured water, freshly lit candles. I love it! Today I thought I'd share with you some of my pamper essentials for a bit of 'me' time..
Lush Snow Fairy Shower Gel, limited edition. Snow Fairy is the quintessential Lush Christmas scent. It smells like lollies and I love using this in the morning for showers and of course the bath for shimmery bubbles. Nivea In Shower Body Lotion* If you have dry skin then this is great for you. This is basically a lotion and moisturiser in one which means you don't have to use an additional moisturiser post-shower. It's very good at clearing up any dry patches you may have. While the scent can be a bit overpowering in the shower it does fade quite quickly. Lush Golden Wonder Bath Ballistic, limited edition. Lush's bath ballistics are my favourite, especially the Christmas ones. It shares its scent with the Celebrate body lotion and contains lime oil and orange flower absolute. Your bath is filled with glittery stars which leave behind turquoise blue water. I'll definitely be picking up more of these before the end of the year. Rimmel Salon Pro Nail Polish in Jazz Funk* I love painting my nails despite not being very good at it. Rimmel takes all the hard work away with these polishes though. Their wide brush and opaque finish make this super easy to apply. The Week in Instagrams @nanawintour: *Finally found some midi rings this week. These are from Diva. *Coffee+Cupcakes and Cashmere-oh my! *The best mask ever. *Mexico date with Hannah. Those non-alcoholic Margaritas were so good! *Jelly sandals are back in my life. They're surprisingly comfortable too. *Miss Vogue in review. Must-Watch of the Week: Halloween isn't as celebrated here as it is in the States but that hasn't stopped our local beauty gurus from filming their own Halloween makeup tutorials. This tutorial by Sally is awesome. The cobwebs and dark contours add a touch of spookiness but the rest of this makeup is quite pretty, which I like. Product of the Week: Mac Eyeshadow in Satin Taupe. This is an eyeshadow that I tend to forget about sometimes and I'm not really too sure why as it is so versatile. I've been wearing this with Bronze and also using it to line my eyes. This is definitely a colour I'll be using a lot more next Winter. Must-Read of the Week: Into The Gloss ran a two-part interview this week with Emily of Cupcakes and Cashmere. 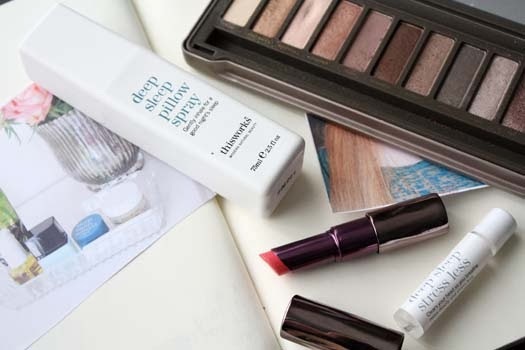 She offers an insider's look into what's top of her beauty shelf and also insights into blogging and her achievements. She also revealed that she's working on another book, yay! You can read the interview here and here. Added to the Wishlist: I'm off to Melbourne for a holiday next month, more on that later. I've already started thinking about what I want to do and more importantly where I want to go shopping. Anyway, I discovered Priceline online and knew I had to visit there. My Australian readers are probably laughing because Priceline is essentially a pharmacy albeit an awesome one. Anyway, top of my wishlist is some Essie polish which currently can't be purchased here. Watermelon and Mint Candy Apple are both shades I hope to purchase. *Have an amazing weekend everyone! I'm doing the usual study bits and pieces but also am going to the One Direction concert on Saturday. Yes, I'm a fangirl but c'mon, Harry Styles. 'Nuff said..
As soon as the Miss Vogue promos started to appear in my Twitter and Instagram feeds I was on Google and texting Maria pretty quickly. Tracking it down was a little bit more of a mission but after picking up my copy in town I set about reading the magazine to find out just what exactly Miss Vogue is. For those not in the know, Miss Vogue is a magazine aimed at teens and 20-somethings who are up to speed on all things, fashion, beauty and pop culture. This magazine is for the trendsetters, the worshippers and the fans who just can't get enough of the Vogue Magazine empire. I was really impressed by the inaugural issue of Miss Vogue Australia. It was exactly what I expected it to be and more-you can bet I will be getting the next issue once it hits newsstands! To prevent sounding like too much of a fangirl I've compiled a list of what I liked and disliked from the first issue. Read on..
*An article about the Evolution of the Selfie and its continually evolving effects on society today. If you cast your mind back five years ago we didn't have reverse cameras. Selfies came care of Webcams or the camera facing towards a mirror so you could see what you were doing. With the introduction of iPhones, Instagram and more recently SnapChat, it's not surprising the way the selfie has changed and this article made for interesting reading. 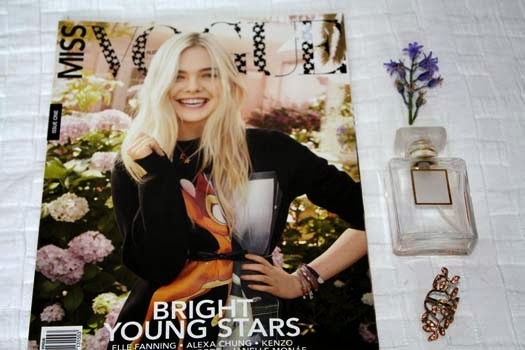 *Elle Fanning, the cover star. The accompanying editorial with Elle is stunning and if you haven't seen the pictures then you should get on Google. *The mix of stories. An interview with Lorde, skater style and a look at Alexa Chung's new book all stood out but there were so many good ones. *The beauty stories, in particular on Aesop-an Australian skincare brand who I didn't know much about. The men's take on perfume is also worth a read. *The one thing I disliked is that some content was only accessible through the Miss Vogue iPad app. That is all well and good if you own an iPad but I currently don't so that was a little disappointing. Maybe they'll introduce an iPhone app eventually. *Have you read Miss Vogue? What are your thoughts? Once I find myself in a comfortable routine, whether it be with makeup or jewelry, I tend to just stick to it. While this can be convenient, especially when you find yourself with only ten minutes to spare (me on Friday, not ideal), it can also get a bit tired and boring. So last week I decided to shop the beauty stash and unearthed one or two things I've neglected a bit lately. Mac Eyeshadows in Woodwinked and Trax Given that I seem to wear All That Glitters religiously it's hardly surprising that I'd forgotten about these colours. I wore Woodwinked a lot last Summer though. It's a softer gold and looks less foiled and metallic which I like. This is great on its own or layered with sheer glitter over the top. Trax is a colour I actually purchased at a Sephora in France. It's quite a glittery shade in the pan but on the lids it has more of a matte finish. This shade is perhaps more Wintery but it would look nice blended out with other colours. Stila Convertible Colour in Gerbera, available here. When I purchased this earlier in the year I wore it virtually every day for about a month and then forgot about it. This coral pink looks frightening in the container but once it's blended out it looks very natural. You can also use these as a lip colour. 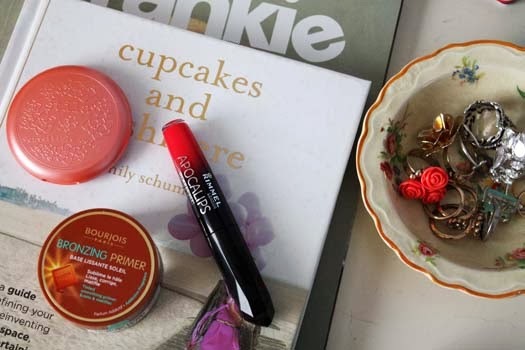 Korres Lip Butter in Pomegranate On a daily basis I tend to reach for my Jasmine lip butter. It's one of the first things I see in my drawers and also I love the scent. Now that Summer is fast approaching this one will probably make its way into my bag a lot more as I reach for sheerer lip products out of convenience. Not only does this add a pop of colour but it also keeps your lips hydrated and chap-free. Mac Lipsticks in Show Orchid and Lickable These colours are both usually reserved for special occasions and really they deserve to be worn more because they are both so pretty, *taps wrist*. Both these pinks are also really long lasting as well and if you're ever after a pink lipstick, Mac do really gorgeous ones. Smashbox High Definition Concealer in Light There's no real reason as to why this concealer hasn't been used a lot recently other than the fact that this shade has yellow-undertones so sometimes it can look a bit orange on my face. Now that it's getting closer to Summer this is a better match for my skintone so I've been wearing it a lot lately. This is best applied with a small detailer brush and it blends really easily. Smashbox have concealers that are targeted towards more porcelain complexions so if you're after a new one, then you should go check out theirs. 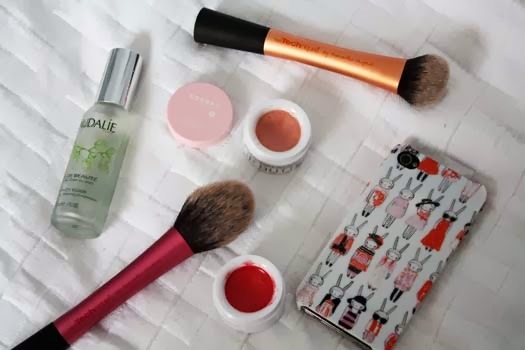 *What beauty products have you been neglecting lately? As you can tell from the title I went on a little HQHair spree with a friend of mine recently. HQHair is similar to Beauty Bay and Feel Unique, it just specialises in more haircare brands than the other two. Another drawcard of course is that they sell Nars and it is considerably cheaper than it is in the shops here. We were really happy with the affordability of our HQHair purchases. One thing to note though is that orders take around 2-3 weeks to ship, to the Southern Hemisphere at least so if you need to reorder anything then it's better to do it well in advance. Everything arrived safe and sound though so I'm sure I'll use HQHair again in the future. GlamGlow SuperMud Clearing Treatment This is probably one of the more expensive face masks on the market but I'd seen it popping up time and time again in blogs and on bestseller lists so I wanted to give it a go. HQHair is the cheapest place where I have found this face mask so far. This mask is designed to tighten skin texture and pores. It also works to fight against blemishes and breakouts. In all honesty the smell of this mask really isn't appealing. If you're a fan of black licorice though you may like it (!). Once you get past its scent though this mask is amazing. I've been using it as both a spot treatment and face mask and it has made such a difference to my skin. Blemishes are reduced and aren't as prominent. The overall condition of my skin seems to be better as well. This mask is well worth its hype.